-It stores the essence (jing) and it dominates human reproduction and development. -It dominates bone, water metabolism and the reception of qi from the air (Kong Qi). -It produces marrow to fill up the brain and manufactures blood. -It manifests in the hair (on the head), and it opens into the ear and dominates the two lower yin. -It dominates the anterior and posterior orifices while housing the Zhi (will-power). 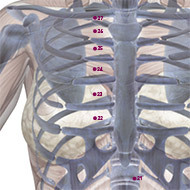 This meridian contains 27 acupoints in one side, that is 54 acupoints in total. 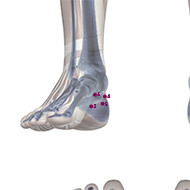 Location: On the sole, in the depression when the foot is in plantar flexion, approximately at the junction of the anterior one-third and posterior two-thirds of the line connecting the base of the 2nd and 3rd toes and the heel. Indications: Headache, blurring of vision, dizziness, sore throat, dryness of the tongue, loss of voice, dysuria, infantile, convulsions, feverish sensation in the sole, loss of consciousness. Method: Puncture perpendicularly 0.3-0.5 inch. Moxibustion is applicable. Vasculature: Deeper, the plantar arterial arch. 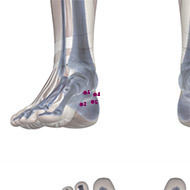 Innervation: The second common plantar digital nerve. 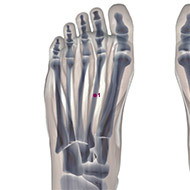 Location: Anterior and inferior to the medial malleolus, in the depression on the lower border of the tuberosity of the navicular bone. Indications: Pruritus vulvae, prolapse of uterus, irregular menstruation, nocturnal emission, hemoptysis, thirst, diarrhea, swelling and pain of the dorsum of foot, acute infantile omphalitis. Vasculature: The branches of the medial plantar and medial tarsal arteries. Innervation: The terminal branch of the medial crural cutaneous nerve, the medial plantar nerve. Location: In the depression between the tip of the medial malleolus and Achilles’ tendon. Vasculature: Anteriorly, the posterior tibial artery and vein. Ihnervation: The medial crural cutaneous nerve, on the course of the tibial nerve. 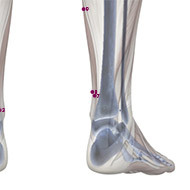 Location: Posterior and inferior to the medial malleolus, in the depression anterior to the medial side of the attachment of Achilles’ tendon. Indications: Spitting of blood, asthma, stiffness and pain of the lower back, dysuria, constipation, pain in the heel, dementia. Vasculature: The medial calcaneal branch of the posterior tibial artery. Innervation: The medial crural cutaneous nerve, on the course of the medial calcaneal ramus derived from the tibial nerve. 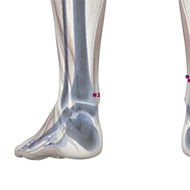 Location: 1 cun directly below Taixi (KD-3) in the depression of the medial side of the tuberosity of the calcaneum. Indications: Amenorrhea, irregular menstruation, dysmenorrhea, prolapse of uterus, dysuria, blurring of vision. Regional anatomy: See Dazhong (KD-4). 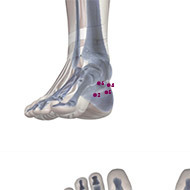 Location: In the depression below the tip of the medial malleolus. Indications: Irregular menstruation, morbid leukorrhea, prolapse of uterus, pruritus vulvae, frequency of micturition, retention of urine, constipation, epilepsy, insomnia, sore throat, asthma. Vasculature: Posteriorly, the posterior tibial artery and vein. Innervation: The medial crural cutaneous nerve; deeper, the tibial nerve. 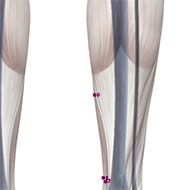 Location: 2 cun directly above Taixi (KD-3), on the anterior border of Achilles’ tendon. Indications: Edema, abdominal distension, diarrhea, borborygmus, muscular atrophy of the leg, night sweating, spontaneous sweating, febrile diseases without sweating. Method: Puncture perpendicularly 0.5-0.7 inch. Moxibustion is applicable. Vasculature: Deeper, anteriorly, the posterior tibial artery and vein. Innervation: The medial sural and medial crural cutaneous nerves; deeper, the tibial nerve. 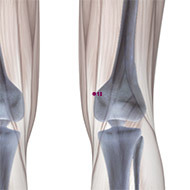 Location: 0.5 cun anterior to Fuliu (KD-7), 2 cun above Taixi (KD-3) posterior to the medial border of tibia. Indications: Irregular menstruation, dysmenorrhea, uterine bleeding, prolapse of uterus, diarrhea, constipation, pain and swelling of testis. Vasculature: Deeper, the posterior tibial artery and vein. Location: 5 cun directly above Taixi (KD-3) at the lower end of the belly of m. gastrocnemius, on the line drawn from Taixi (KD-3) to Yingu (KD-10). Innervation: The medial sural and medial crural cutaneous nerves, deeper, the tibial nerve. Location: When the knee is flexed, the point is on the medial side of the popliteal fossa, between the tendons of m. semitendinosus and semimembranosus, at the level with Weizhong (BL-40). Indications: Impotence, hernia, uterine bleeding, dysuria, pain in the knee and popliteal fossa, mental disorders. Method: Puncture perpendicularly 0.8-1.0 inch. Moxibustion is applicable. Vasculature: The medial superior genicular artery and vein. Innervation: The medial femoral cutaneous nerve. 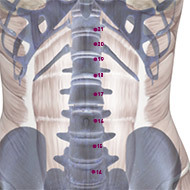 Location: 5 cun below the umbilicus, on the superior border of symphysis pubis, 0.5 cun lateral to Qugu (CV-2). 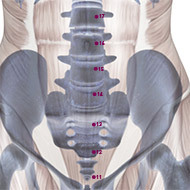 Indications: Fullness and pain of the lower abdomen, dysuria enuresis, nocturnal emission, impotence, pain of genitalia. Method: Puncture perpendicularly 0.5-1.0 inch. Moxibustion is applicable. Vasculature: The inferior epigastric artery and external pudendal artery. Location: 4 cun below the umbilicus, 0.5 cun lateral to Zhongji (CV-3). Vasculature: The muscular branches of the inferior epigastric artery and vein. Innervation: The branches of subcostal nerve and the iliohypogastric nerve. Location: 3 cun below the umbilicus, 0.5 cun lateral to Guanyuan (CV-4). Indications: Irregular menstruation, dysmenorrhea, dysuria, abdominal pain, diarrhea. Location: 2 cun below the umbilicus, 0.5 cun lateral to Shimen (CV-5). Location: 1 cun below the umbilicus, 0.5 cun lateral to Yinjiao (CV-7). Location: 0.5 cun lateral to the umbilicus, level with Shenque (CV-8). Indications: Abdominal pain and distension, vomiting, constipation, diarrhea. Location: 2 cun above the umbilicus, 0.5 cun lateral to Xiawan (CV-10). Vasculature: The branches of the superior and inferior epigastric arteries and vems. 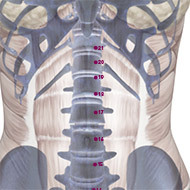 Innervation: The ninth intercostal nerve. Location: 3 cun above the umbilicus, 0.5 cun lateral to Jianli (CV-11). Indications : Vomiting, abdominal pain, constipation, postpartum abdominal pain, sterility. Regional anatomy Vasculature: The branches of the superior epigastric artery and vein. Location: 4 cun above the umbilicus, 0.5 cun lateral to Zhongwan (CV-12). 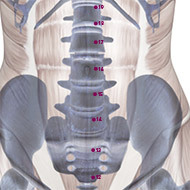 Regional anatomy: See Shiguan (KD-18). Location: 5 cun above the umbilicus, 0.5 cun lateral to Shangwan (CV-13). 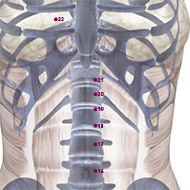 Regional anatomy: See Shlguan (KD-18). Location: 6 cun above the umbilicus, 0.5 cun lateral to Juque (CV-14). Indications: Abdominal pain and distension, indigestion, vomiting, diarrhea, nausea, morning sickness.. Method: Puncture perpendicularly 0.3-0.7 inch. To avoid injuring the liver, deep insertion is not advisable. Moxibustion is applicable. Regional anatomy Vasculature: See Shiguan (KD-18). Location: In the fifth intercostal space, 2 cun lateral to the Conception Vessel. Indications: Cough, asthma, distension and fullness in the chest and hypochondriac region vomiting, anorexia. Method: Puncture obliquely 0.3-0.5 inch. To avoid injuring the heart, deep insertion is not advisable. Moxibustion is applicable. Vasculature: The fifth intercostal artery and vein. 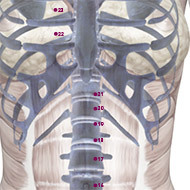 Innervation: The anterior cutaneous branch of the fifth intercostal nerve; deeper, the fifth intercostal nerve. 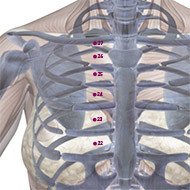 Location: .In the fourth intercostal space, 2 cun lateral to the anterior midline. Indications: Cough, asthma, fullness in the chest and hypochondriac region, mastitis. Method: Puncture obliquely 0.3-0.5 inch. Moxibustion is applicable. Vasculature: The fourth intercostal artery and vein. 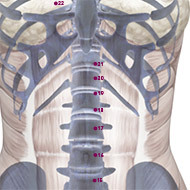 Innervation: The anterior cutaneous branch of the fourth intercostal nerve; deeper, the fourth intercostal nerve. 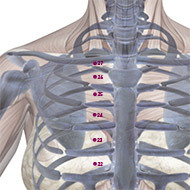 Location: In the third intercostal space, 2 cun lateral to the anterior midline. Vasculature: The third intercostal artery and vein. 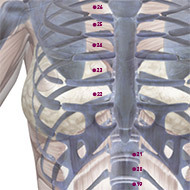 Innervation: The anterior cutaneous branch of the third intercostal nerve; deeper, the third intercostal nerve. Vasculature: The second intercostal artery and vein. 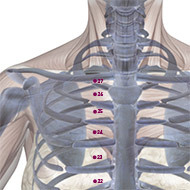 Innervation: The anterior cutaneous branch of the second intercostal nerve; deeper, the second intercostal nerve. Indications: Cough, asthma, accumulation of phlegm, fullness in the chest and hypochondriac region. Vasculature: The first intercostal artery and vein. Innervation: The anterior cutaneous branch of the first intercostal nerve, the medial supraclavicular nerve; the first intercostal nerve. 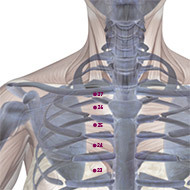 Innervation: The medial supraclavicular nerve. This meridian originates from the plantar surface of the little toe and runs obliquely towards the center of the sole (Yongquan, KD-1). 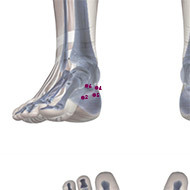 Then, it emerges from the lower aspect of the tuberosity of the navicular bone (Rangu, KD-2), it runs behind the medial malleolus where one of its branches enters the heel. Then, it ascends along the posterior border of the medial side of the lower leg to the medial side of the popliteal fossa and goes further upwards along the posteromedial aspect of the thigh to the coccygeal region (Changqiang, GV-1). 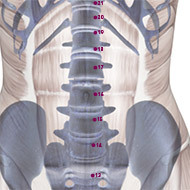 From there, it runs through the vertebral column, enters the kidney and links with the urinary bladder.